The QOS 32-Bay drive array system is the perfect blend of performance and affordability. 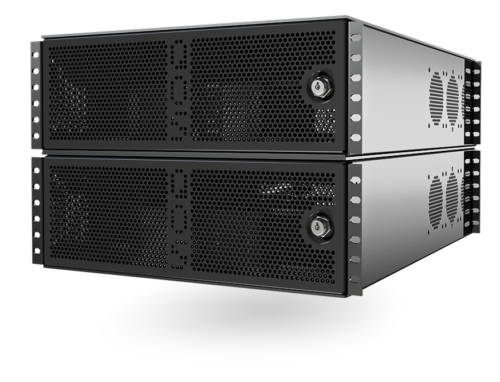 The QOS 32-Bay is ideal for the media professional working in large format projects that need fast and reliable access on-set. The 32-Bay is the most adaptive of the series built with enough storage capacity to run several HD (or 4K) editing projects at once. The internal metadata controller is compatible with shared file systems such as our own QOS SAN and QOS Spaces or StorNext with up to eight high-speed Fibre or 10Gbit Ethernet users. It can be controlled by an external server as part of a SAN, or can be used either single-user or shared via direct attached with the freedom to add more storage by attaching a QOS 32-Bay expander unit. Supports bin locking for Avid, FCP and Adobe editing workflows. Supports 1GbE, 10GbE, 40GbE and 4,8 and 16/32 Gb Fibre Channel connectivity. Supports file-level sharing (multi-write mode). Performance maintained in multi-user write mode. Superior LAN performance with block-level access. Native cross-platform support (no third party software). Automated file system management (auto-defrag). Virtual volume creation with dynamic resizing. Proxy generation for remote access from anywhere. Replication & Tiering module with life-cycle management (HSM). Shock-mounted cases allowing ship servers with drives installed in the server. Raid, independent of hardware components swaps.